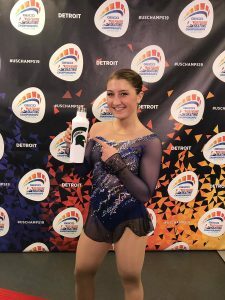 It wasn’t just the medalists who shined in the Motor City during the 2019 U.S. Championships. 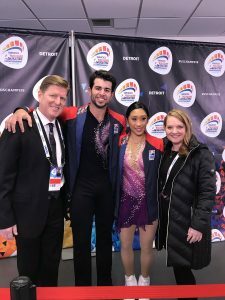 There were some other special stories that came out of the event, from skating in front of a hometown crowd, to senior debuts, to last-minute program changes, to travel nightmares! Though finishing in a disappointing 15th place, the U.S. Championships was still a memorable event for Hannah Miller, who trains in Lansing, Michigan and attends Michigan State University. Figure Skaters Online caught up with her after her free skate about skating in front of a hometown crowd. 2018 U.S. Junior Champions Audrey Lu and Misha Mitrofanov were making their senior Nationals debut in Detroit. They finished the short program in 5th place, just two points out of third, but unfortunately, Mitrofanov was fighting off illness going into the free skate.They finished the event in 6th place. Figure Skaters Online caught up with them after their free skate. 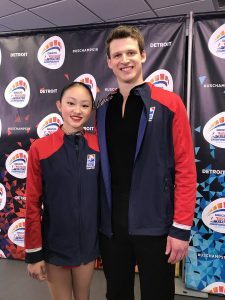 The 2019 U.S. Championships was the nationals debut for the new team of Jessica Calalang and Brian Johnson, who teamed up in the summer of 2018. The team trains in Aliso Viejo, CA with U.S. Pairs Champions Jenni Meno and Todd Sand. They finished their first Nationals together in 5th place. 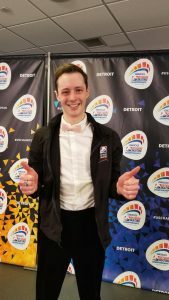 The U.S. Championships in Detroit was also memorable for Sean Rabbitt for other reasons! The 28-year-old from Yorba Linda, Calif. was stuck in Chicago and ended up taking a train to get to Detroit. He documented his experiences on his social media accounts. Rabbitt managed to put his travel nightmare aside to skate a personal-best score program, to enter the free skate in 7th place. He finished the event in 8th overall. 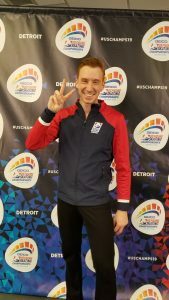 Figure Skaters Online caught up with him after the short program. For skaters competing at Nationals, their programs are pretty familiar to them as they have been training and competing them since the summer. But for Jordan Moeller, he debuted a brand, new free skate at the U.S. Championships to Panic! at the Disco’s “Nearly Witches” which many skating fans described as a bold choice in music selection for Moeller. Figure Skaters Online caught up with Moeller after his free skate. Moeller finished the event in 13th place. Jordan Moeller: That program (“Nearly Witches”) is about a month old (roughly). I competed at Sectionals and I had a great short. Long, obviously, was not so great. The music that I was skating to earlier (“Light of the Seven”) from Game of Thrones, it is very beautiful music, it is very powerful music, but it is a very somber piece of music and that tone carries through and in my opinion, it felt like one of those programs were it had to be skated so well element wise and choreographically in order for it to be received well. After coming off Sectionals and I got back to Colorado, I had another run through or two that went about as similarly (as Sectionals), and I went up to (my coach) Kori (Ade) and said, ‘We need to change this now.’ Which we apparently agreed on, but she didn’t tell me because she knows how particular I am about my music. So she agreed and said, ‘I have been thinking the same thing, but didn’t want to tell you because I thought you would be mad at me.’ (laughs)’. So we kind of thought through it. I had several pieces of music that I wanted to skate to. If I had time to skate to everything that I wanted to, I would be skating for 70 more years (laughs). So this one is by Panic! At the Disco, one of their older songs, “Nearly Witches.” It has been one of my favorite songs for a really long time and I felt like I needed something different, I need a change and I felt this is something that is not only different for me and my own skating but I don’t think that kind of program has been skated, to the best of my knowledge before anyways. So I was hoping to bring something fresh to the stage. Obviously, I had a little bit of a leap of faith there because obviously I only had a month to adapt what I had to kind of fit that music.